The Washington Redskins and Cincinnati Bengals played to a 27-27 draw Sunday in London as the NFL got its second tied game in a season for the first time since 1997. "It definitely feels more like a loss than a win, because we moved the ball so well and had so many opportunities to win," Cousins said. "It was slick out there, but that didn't have an effect on any of my kicks," said Hopkins, who also was badly short on a 55-yard attempt at the end of the first half. 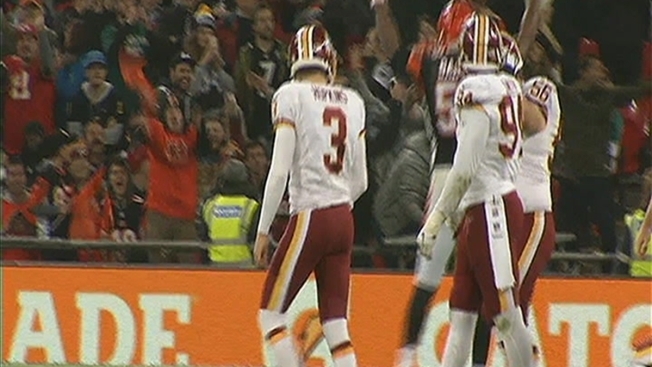 The Redskins got the ball back with 1:11 remaining when Dalton fumbled at the Bengals 47 on a quarterback sneak. Cousins couldn't connect downfield and tossed his final desperate pass tamely into the sideline to preserve the draw. Cincinnati is 3-4-1. "Obviously not winning the game is disappointing," Bengals coach Marvin Lewis said. "We had opportunities on both sides of the ball to win it." Cousins finished with 38 completions for a season-high 458 yards on a team-record 56 attempts, with touchdowns to Jordan Reed and Jamison Crowder. He also threw an inconsequential interception on a deep ball. Dalton completed 27 of 42 for 284 yards and a touchdown to Tyler Eifert, who saw his first significant game action following offseason back surgery. Eifert made nine catches for 102 yards, while A.J. Green generated 121 yards on nine catches. Dalton also tossed a costly interception early in the fourth quarter with the Bengals driving deep into Washington territory. THE 1997 TIES: Oddly, the last time the NFL had two ties in a season also happened in back-to-back weeks. In Weeks 12 and 13 of the 1997 season, Baltimore and Philadelphia tied 10-10, followed seven days later by Washington and the New York Giants' 7-7 draw. Washington took its opening possession 80 yards on a 15-play drive capped by Robert Kelley's juking 4-yard run. It was the first NFL rushing touchdown for Kelley, an undrafted rookie from Tulane starting in place of an injured Matt Jones. KICKING WOES: It wasn't only Hopkins ruing his errors. The Bengals' Mike Nugent had a chance to tie at 10, but his low-trajectory 51-yarder spun wide left. Nugent has often struggled from long range throughout his 12-year career. He has yet to convert a field goal beyond 47 yards this year, and fell to 0-for-3 from 50 yards or more. Nugent then missed his first extra point of the season, wide left following the Bengals' go-ahead drive of the second half. "We missed a PAT, we missed a field goal, and those things eventually came back to hurt us," Lewis said. WATCH THOSE HANDS: The Redskins' star cornerback Josh Norman was called four times for illegal use of hands. It's a shame for Washington that those hands weren't as sticky to the ball. Norman dropped two great interception opportunities while jumping routes on short sideline throws to A.J. Green. The first hit him squarely in both hands on the Bengals 39 near the end of the first half, the second was in Redskins territory during the Bengals' opening drive of the second half. A pick then would have stopped the Bengals from seizing the lead barely a minute later. SEEING YELLOW: The game was marred by penalties, particularly by the Redskins. Washington was flagged 15 times for 106 yards, leading to eight Bengals first downs and damaging Washington's overtime drives into Bengals turf. Cincinnati had seven penalties for 85 yards. UP NEXT: Both teams have byes.